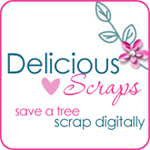 Delicious Scraps: Re-Release Time!! "Gorjus Halloween" Is back an the final installment of "Charming X-Mas 08"
Re-Release Time!! "Gorjus Halloween" Is back an the final installment of "Charming X-Mas 08"
And here is the final installment of "Charming X-Mas" '08. Have not decided whether I will make any add-ons this year yet. The kit is made with clipart by Trina Clark! Click on the banner to visit her store! There are four downloads - just click on the little previews to get them :) Downloads via 4Shared. Thank you so much for this Freebie. I want to let you know that I posted a link to your blog in CBH Digital Scrapbooking Freebies, under the Page 2 post on Oct. 07, 2009. Thanks again. Oops, I just sent another thank you...and I already thanked you earlier. Of course if you want you can post that one too or just delete it. Either way is okay with me - -hehe. Talk about dense, LOL. Hugs!! Merci, merci, merci, merci beaucoup for these last 4 parts of your cute Christmas kit !! OHHH so cute these are! Thank you so much!